Just a note, I hate transcribing anyway, but I have had a major right arm injury (difficult to transcribe and type) so there are going to be typos and I hate apostrophes anyway. Just letting you know. MP3 Audio Dec. 18, 2013 Elk Brucellosis local "work group" meeting that met at the Livingston MSU Extension office. Elk Distribution Map This map was created by FWP Wildlife Biologist Livingston overlaying data from 4 years (2010-2013) onto one map, making it appear as though there are 4 times as many elk in Park Co. than there actually are. She proceeded to explain the information, circled known herds and listed their approx. herd sizes. 20:11 - Steve Kelly, with the Alliance for the Wild Rockies asks, "Compared to earlier data, decades, how does this compare?" FWP Wildlife Biologist Livingston Karen Loveless replied, "Distribution isnt that different. Concentrations have changed, siz of groups, used to be that most of the elk were in small groups, now most of the elk are in large concentrations, thats the main difference." SK, "Aggregate totals similar?" KL, "Mid 90's numbers were similar." 23:14 - Karen finished with the map. MSU Extension personnel printed a new map for members. 24:00 - FWP Quentin Kujala (Helena administrator for this Elk Management Iin Areas WIth Brucellosis) explained the 2014 Final Work Plan applications. NOTE, all Proposed Recommendations deviate from Montana Code Annotated laws such as Game Damage laws, which require public hunter access during the general season, to receive. Under this program, all actions are paid for by sportsmens dollars with no public hunter access requirement. Hazing - begin after the general season to June. Small scale fencing available through out DSA, year round. Elk Management Removals, EMR's (last seasons Dispersal Hunts) not to exceed 250 elk in the entire DSA. 10 EMR's in each action. Multiple EMR can be stacked on top of each other. Kill Permits - difference, instead of bringing a hunter on board, a landowner or land owners agent or an agent of the department is authorized to take that elk. 5 total elk on each kill permit. 33:30 - Quentin begins to address the fact that this program does not have the public hunter access requirement, such as Game Damage, directed by Montana Code Annotated, and never really addresses, getting off into the weeds. "...people with the experience with game damage, there is by statue an access requirement in place before a landowner is eligible to receive Game Damage assistance from the department and so the question becomes, is that same sort of thing in place for brucellosis risk management? Its not in place, in the same way, by statutory direction, but by commission adoption, they clearly have said, let me back up (this is a touchy area since I have repeatedly brought this issue up with FWP and the FWP Commission that this requirement is missing and should be added in, which they have not done. So Kujala is about to lay this at the feet of the FWP Commissioners and backs up.). We have heard the Statewide Working Group (now he is about to lay this omission on the civilian Statewide Working Group members and shifts direction again) recognized that concentration of elk that can result from access situations, restrictions on access is a real thing and they do have potential to be part of this consideration, part of commingling enhancement and so they are something that needs to be recognized. They recognized the issue is a difficult one, it certainly doesnt have it easy, across the board answer, as to how to engage that circumstance. So that actually was one of the big topics that prompted the Statewide Working Group to identify local conversations. They recognized those things are real, they happen, they're on the landscape, they're something to think about, local working groups do that, think about that. The commission, picked that up, went a little further, and they said, 'hey, in the context of being both comprehensive and effective, yes, those things are real, and yes, that statewide working group had a good idea. Make sure that local conversation identifies those on the landscape.' The intent is to be comprehensive and effective. And provide some input on how to proceed today. So thats something we do have to keep in mind, to say differently, if there are these situations out there, commingling events, tied to elk concentrations that are associated with limited or no access. And if there is not a voice, if theres not some recommendations, some recognition of that circumstance as it contributes to this situation, I think its reasonable to expect the commission to at least challenge, if not deny, a management action on that particular property. 35:50 - Discussed proposals for new, modified or addition tools/work plan may be to FWP Commission. 36:50 FWP Quentin Kujala mentions tha the Madison County Elk Brucellosis Work Group, the current dates are not fitting in their mind. They want extended kill permits and EMR's as well. Commission proposals can add to or modify Work Plan. 42:20 - Fencing Question - Rep. Alan Redfield mentions he has 160 acres of hay meadow, all fenced off, about $5,000 a mile, 6 ft. high, 5 wire electric fence, 9,000 volts because of the hollow hair on them (elk). 44:20 - Steve Kelly asked how these tools tier to the current elk management plan statewide? Quentin Kujala replies they are not specific to the elk plan, not an amendment to the elk plan. Steve Kelly then asks about an Environmental Review. Quentin Kujala replies that they have used commission adoption to bring these on board, "...there has not been an EA specific to these elk management actions." 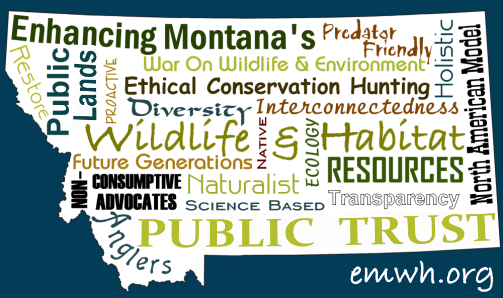 Before the Oct. 2013 Commission meeting, trying to find some way to encourage the FWP Commissioners to manage for wildlife, rather than livestock, I dug through the Montana Code Annotated sections that dealt with the FWP Commission. This is what I found: Title 87-1-301 (J) FWP Commissioners requirements, "(j) shall comply with, adopt policies that comply with, and ensure the department implements in each region the provisions of state wildlife management plans adopted following an environmental review conducted pursuant to Title 75, chapter 1, parts 1 through 3." The 2004 Montana Statewide Elk Management Plan, pg. 39 has 5 small paragraphs on brucellosis, very outdated, none of which deals with managing elk per the Proposed Recommendations. The Statewide Plan then goes into Game Damage, beginning on pg. 40. So I read off a list of legal violations this program has committed, to the FWP Commissioners, at that Oct. commission meeting, no longer calling for an independent audit, rather an environmental review, as they are required to do. They passed the 2014 Work Plan. So this is the frame of reference for Steve Kelly's question. 47:20 - In response to Quentin Kujala's statement of commission adoption, I, Kathryn QannaYahu, read off the finding of the Montana Legislative Services Division, Legal Services Office, Legislative Inquiry into the MT Elk Management In Areas With Brucellosis finding - "Based on a review of the foregoing information, it appears that there is no specific reference in the Montana Code Annotated regarding the Departments's authority to manage elk for purposes of reducing or preventing the transmission of brucellosis between elk and livestock." Dec. 6, 2013 Kujala replies, "The department believes there is adequate process in place." 48:30 - Quentin Kujala, "And in fact, a path to that end was initiated the last legislative session." I asked, "Are you referring to HB 312?" HB 312 is Rep. Alan Redfields Elk Brucellosis test and slaughter bill. Quentin Kujula, "And that would have specifically identified any statute." 50:37 - Going forward with the meeting agenda, Druska Kinkie suggests that rather than waiting for a formal plan and losing the window of opportunity, they break this down into pieces. She suggests they propose a modification of the 2014 Work Plan end date for lethal actions of April 30th to May 15th. The MSU fencing representative brought up studies that show $1500.00 a mile fencing modifications for materials, 100% excluded in a high risk pasture. 57:30 Gates and fencing, are 2 modifications this local work group could submit to the commission. 1:00:40 - A gentleman brought up clarification of transmission of brucellosis, asking elk birthing dates. Quentin Kujula states June 1 is peak. The gentleman asked infection time period. Druska Kinkie states bacteria is pretty long lived, depending on conditions. She then points out that the department of livestock (Dr. Eric Liska attending) if there are any questions. Druska asks Dr. Liska about live births shedding the brucellosis bacteria. Dr. Liska said all he could do is speak in generalities because a wildlife veterinarian is not here, that he is a veterinarian for cattle. He states the main concern is not the live birth in June with sunlight and heat, its more the abortion time. The gentleman asks if that would be in May? He asks when peak abortion period would be? 1:05:21 - FWP Quentin Kujula, "I dont know if the wildlife vet, I dont know if thats clear...Ive not heard clarity on a peak. I have heard connection of January 15th is when research, monitoring and surveillance starts to pick up abortions, but beyond that, I dont know how much clarity there is. Quentin Kujula then bring ups the persistence study, stating 83 or 89 days. (Every time he brings this up in public, I object and clarify what this study is about and object to FWP using it irresponsibly.) Environmental Persistence of Brucella abortus in the Greater yellowstone Area Pg. 4, right column, near bottom, under Results - 81 days. 1:10:56 - I had been waiting with my hand up, to answer the question that had been asked about the threat of the birthing period and the abortion risk period, that 3 FWP personnel, involved with the elk brucellosis program did not answer. Kathryn QannaYahu, "This is from A Risk Analysis of Brucella abortus Transmission Among Bison, Elk, and Cattle in the Northern Greater Yellowstone Area, A Technical Report to the National Park Service, October 2010, of which Dr. Marty Zaluski, the Montana State Vet, is a contributor, 'The probability of B. abortus transmission between elk (or from elk to cattle) is likely low during calving (May through June) because elk dams segregate themselves while giving birth and meticulously clean the birth site. Thus, birth sites are dispersed, and the likelihood of other elk or cattle encountering infected birth tissues and fluids is low. However, transmission risk may be higher during the brucellosis abortion period from February through April when many elk aggregate in larger groups on lower-elevation winter ranges that sometimes include ranches'...So thats your time period." 1:12:00 - They go back to the modifications. Druska brought up that there was only one hazer, suggested more. Rep. Alan Redfield brought up corridors, pointing out that his fence pushes elk to one of the neighbors, which they might not want. The group discussed more of the language of what they wanted to present to the FWP Commission. 1:22:30 - Quentin Kujula explained the current 2014 Elk Work Plan process that is available to them right now, while they set up the technology for the electronic vote. 1:36:35 - FWP Karen Loveless explains the season proposals for those Elk Hunting Districts. Quentin Kujula also described the current Statewide Elk Plan. 1:48:05 - On the voting questions, the majority of the votes were for the extension of the end dates for kill permits and Elk Management Removals, as well for the fencing modifications. They decide that another meeting in January is going to be necessary. They also suggest an individual volunteer to present the pro fencing argument and one for the against. I did not volunteer for the against for 2 reasons: 1. I wanted to look into fencing laws and 2. I wanted to see if the Park Country sportsmen were going to object about sportsmens dollars being used for this massive fencing, or any other objection. They did not. 1:59:20 - Kathryn QannaYahu, "Based on some of the questions, especially from a biological perspective that came up, I have one question for the group: Have any of y'all seen the FWP's presentation concerning elk management in areas with brucellosis? I know Hayes and Lou have, because one was given at Park County Rod and Gun Club in April, but have any of y'all ever seen that presentation or a similar one?" It was asked if that was given by Karen Loveless? "No, the one in April was done by Quentin and the one that was done in Bozeman, in December before, was done by Karen and Neil Anderson, both did that one jointly." Quentin stated, "Kathryn, I dont think the group has seen that package...they've seen pieces of it." Alan Redfield explained that they have had Neil Anderson, 4 different times at meetings. "Thats what I was wondering because there were some questions dealing, like with the abortion time period and other things that Eric didnt want to address, being more proficient in cattle, but the biology, as a representative that could answer those questions at the next meeting? Because part of what y'all are discussing here, as far as extending dates, gets into the biology. There is a reason that FWP has set the dates for the kill permits, under game damage principles, for the date that they have and its because of the birthing (and gestation) time periods. Hazing, if you extend dates, dealing with that, you're potentially causing an abortion event on a stressed elk cow. So some of this is dealing with biology and if y'all are asking basic biology questions concerning the time periods of abortion events, how long...for example a study was cited dealing with how long Brucella abortus can remain on the landscape. Well the study that was cited was a worse case study. And Dr. Tom Roffe, who was part of that study and led it, stated they never intended that study to be used in the capacity that this Elk Brucellosis Working Group program has repeatedly used it, because it negated predation. They put events around it, it could not be predated, yet at meetings that I have been, where this question has been brought up and that study has been cited, when you look at the factors of predation, temperature, sunlight, the relative risk is minimal. So if you are citing 60-90 days, that is not accurate for native environment. It was a study environment that was conducted in. And that never occurs, thats never been documented out in the wild. So if y'all have got basic biology questions, I suggest you get someone in here to help answer those questions." 2:00:31 - Druska Kinkie, "I would say 2 things, just as a point of clarification. There arent any dates on the hazing tool. Add I think that, in answering Bob's question, which was, how long can it live? Yeah, we gave it can do this or it can do that. So it was a worse case scenario as well as, Quentin said, with predation is much shorter. So, it was a generality. I dont think any of us are setting our sites on the fact that it is 90 days out there, we all know that changes." Here I am going to interject some information. First, being that the Montana State Veterinarian, Dr. Marty Zaluski, frequently, publicly states the average life is 21-26 days. Yet, and I keep addressing this issue, our FWP wildlife "representative" repeatedly uses the irresponsible science of a worst case scenario study to further inflame a situation within the ag/livestock community. Second, Druska Kinkie has appeared in a short documentary video, concerning elk and brucellosis, making it appear that it is a storm or disease and all elk need to be removed from the land. She states, at the 6:25 mark, "the bacteria has the ability to live up to 60-90 days, depending on conditions." There is a reason why I specifically addressed 60-90 days in my statement above. FWP Quentin Kujula generally states a number between 81 and 100. Oddly, the editor of the film does not have any of the scientists interviewed, state anything to that effect. 2:06:00 - The group was wanting a pro fencing advocate and then asked for an against. I asked, "I'd like to ask a question on this. When you're talking about fencing on a larger scale, are you talking about fencing your private property or are you talking about fencing Wildlife Management Areas or other public lands?" Druska Kinkie explained why they want to fence without answering my questions of fencing public lands, so I asked again. "No, I'm understanding your larger landscape question. What Im asking is, because I know that there are people that have their livestock on public lands, as leases, are you talking about fencing out public land leases, specifically..." Again Druska states the size and I had to ask, "...on private land?" And she replied yeah. Steve Kelly asked about public comments and expressed concern over the public participation, because these meetings were unknown, and the general public did not have much of an idea of what was going on.